How do Hackers Hack Bank Accounts and Personal Information? Most people studying hacking have a keen interest in learning how to can hack bank accounts. They become discouraged with the prevailing perception that it is almost impossible to hack credit cards, debit cards, or net banking passwords, which is true to an extent. Today I will discuss with you why hacking bank account information is tough and considered to be almost impossible. We will also discuss the different, contemporary methods that hackers use to hack bank accounts. Almost everybody uses the internet nowadays to pay bills, book reservations and tickets, purchase items, or simply to transfer money. All of these online transactions involve money, meaning they’re using banking information, credit or debit card payments, or simply net banking. Most banks use SSL (Secured Sockets Layer) connection and at least 128 or 256 bit encryption for online banking and transaction purposes. An additional layer of security that companies are introducing is called “transaction PIN layer” which means that for each and every online transaction you have to enter your password, and that during transactions you have to enter a PIN, a type of password between 4 and 8 characters in length. Thus, banks do a lot of work to protect your credentials from the eyes of the world that may wish to gain access to your vital information. 40 bit encryption means there are 2^40 possible keys that could fit into the lock that holds your account information. That means there are billions of possible keys and using brute force is not an option. The only thing left now is a dictionary and rainbow attack. But it’s not only the security measure that banks use to secure information. 128 bit encryption means there are 2^88 times as many key combinations that are possible for 40 bit encryption. That means a computer would require exponentially more processing power and time than a 40-bit encryption to find the correct key. That’s a very powerful method of encrypting data sent from your machine to bank machine. But it’s all useless once your system has been compromised or hacked. Now we’re going to discuss how all these security encryption can be bypassed and your system can be compromised online. There are several methods for exploiting such account information. Note: This is for educational purposes only (for more details read the disclosure). 1. Phishing: We have discussed phishing on this website in a lot of tutorials, such as how to hack Gmail or Facebook accounts. But for newcomers, I’ll explain phishing in some detail. Phishing is a technique used to hack password and login details of a website. Phish pages are simply fake pages that look the original webpage where you’re taking the information from. The only difference between a phish page and the original page is the address bar link (for a normal user), redirection post, and get method (inside source for advanced users). How do you identify a fake link? Just check the address bar URL for a fake page or Phish page. It will be showing a different URL than the original. You can install a web security tool bar in your browser (like AVG and Crawler web security tool bars) to detect the phishing automatically, and to stop your browser from visiting Phishing pages. What is Phishing ? How to defend yourself from Phishing? 2. Trojans: Trojans are a type of virus that steals your information. It can come in many forms like keyloggers or RATs (remote administration tools). A keylogger monitors all the keys that you have pressed on your physical keyboard, stores them in a log, and sends the details to hackers. RATs are an advanced form of keylogger that remotely monitors all your activities, whereas a keylogger is simply a functionality. Using RAT, a hacker can connect to your system anonymously, without your information when you are online. RATs have a huge list of functionalities and they are the best type of hacking tools available on the market. 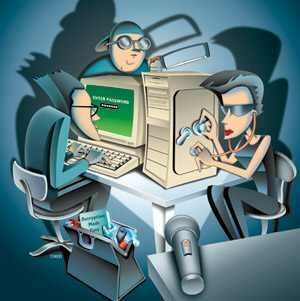 Now, how do you protect yourself from a keylogger? Just keep your antivirus software updated and install a keyscrambler that encrypts your keystrokes. Unfortunately, once the RAT enters your system you cannot do anything other than formatting your system. An RATs attack can only can be prevented before it enters in your system. For RAT prevention, please do not download any software or keygens online. Also avoid downloading freewares from new websites, only use certified websites like CNET, filehippo, etc. Avoid testing fake hack tools because most hacking tools have keylogger and RATs attached to them. Test it under secured conditions like on Virtual Users. 3. Session Hijacking: Most of us use wireless networks to access the internet and data flow in the form of packets and channels. We know that wireless networks are easier to hack due to their weak encryption. When hackers hack wireless networks, they take control of the internet data transfer and redirect the user to their intended path. Suppose you visit Gmail or Facebook, a hacker gains access and then he redirects you to somewhere on the page and captures your account details. Packet sniffing is another way to hack account information and credentials using the wireless networks. Hackers capture packets and decrypt information to get data in the form of plain text. Now how do you prevent this? The solution is also relatively simple, you just need to hide your SSID and BSSID from being discovered by the other networks. Leave the SSID or BSSID empty. Now hackers will not be able to discover your wireless router in order to hack it. To find out more information on these concepts on how hackers hack bank accounts on an ongoing basis simply join our list. 3. 7 Tips to Improve Online Security. That’s all for today friends, I hope you all have liked the discussion about why hacking bank accounts is tough. If you like my information or have any doubts please post your comments.